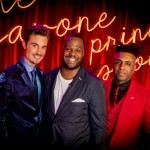 The all new Javone Prince Show starts on BBC2 this Sunday July 19. The house band to feature regularly on the show will be no other than Omar. Getting the national recognition he justly deserves, Omar and the band will air to the nation every week. Tune in this Sunday on 9.45pm.